By 1934, LeDuff writes in his morbidly funny take on how this “most iconic of American cities . . . became a cadaver,” the city was “choking on industry,” with air “the color of a filthy dishrag” and a river so poisoned “it was said you could bottle it and sell it as paint thinner.” Until very recently, the last beaver was reportedly spotted in the river that year. Like listening to him hold court in a corner bar, the book scuttles from one grueling episode to the next, both personal and professional. In an unsettling series of vignettes from stories he covered for the paper during the recent financial crisis — from the corruption of city officials, to the criminally under-equipped firefighters whose main responsibility is to put out insurance-scam blazes in abandoned buildings, to the homeless man notoriously found encased in four feet of ice, his legs sticking out “like Popsicle sticks” — LeDuff flaunts his self-made, tough-guy image while laying bare a surprisingly plus-size heart for his hometown. For all his bluster LeDuff comes across as genuinely brokenhearted by the state of his city. Part of the tale he tells involves his own family, which, he comes to find out, descends from a free black man who passed as white. One of his ancestors, he claims, was a material witness to the city’s first recorded murder. Both his sister and her daughter died tragically, too young, and one of his brothers, who sold subprime mortgages, now toils for $8.50 an hour in a screw shop. If you’re looking for the definitive history of a city that showed the world how to make cars and soul music, this isn’t the place. But if you’re looking for slices of life with a whiff of rancid meat, LeDuff is your man. 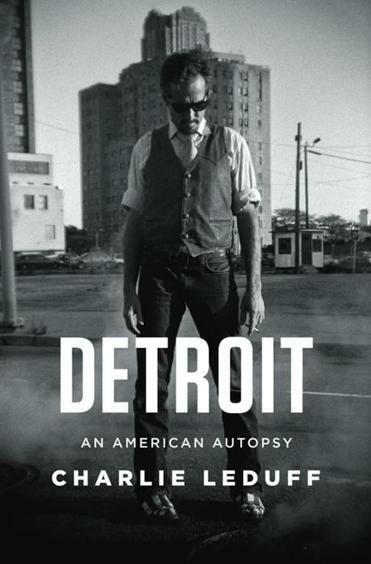 Detroit is suffering terribly, and the author feels compelled to tell it like it is. The city is so desolate, there are areas that have been overrun by deer, coyotes, and wild dogs. “And if you needed a metaphor for how retrograde things were becoming,” LeDuff writes, for the first time in 75 years, a beaver was sighted in the Detroit River. James Sullivan is the author of four books, including “Island Cup: Two Teams, Twelve Miles of Ocean, and Fifty Years of Football Rivalry.” He can be reached at jamesgsullivan@gmail.com.